Do you identify as a geek or a nerd? Unsure? Perhaps this helpful datavisualization can be of some assistance. Spurred by the age-old Geek vs. Nerd Debate, self-proclaimed music geek and science nerd Burr Settles recently turned to Twitter to see how people used the terms "geek" and "nerd" when describing themselves. Using a statistical measure of association known as pointwise mutual information (PMI), Settles pored through millions of tweets in search of which words were most likely to appear near the word "nerd" or "geek." 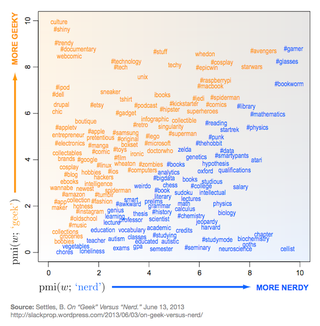 Featured above is a scatterplot of words and hashtags according to their PMI scores in relation to both “geek” and “nerd." A PMI score greater than zero indicates that two words "keep great company," as Settles puts it. A PMI score less than zero, in contrast, indicates the two words tend to keep their distance. The greater the PMI score's magnitude, the stronger its attraction or aversion between the word pair (so two words with a PMI score of 6 appear together more often than two words with a PMI score of 3); and a PMI score of 0 means the two words have a more or less random chance of appearing together in the same tweet. Moving up the vertical axis, words become more geeky (“#music” → “#gadget” → “#cosplay”), and moving left to right they become more nerdy (“education” → “grammar” → “neuroscience”). Words along the diagonal are similarly geeky and nerdy, including social (“#awkward”, “weirdo”), mainstream tech (“#computers”, “#microsoft”), and sci-fi/fantasy terms (“doctorwho,” ”#thehobbit”). Words in the lower-left (“chores,” “vegetables,” “boobies”) aren’t really associated with either, while those in the upper-right (“#avengers”, “#gamer”, “#glasses”) are strongly tied to both. Orange words are more geeky than nerdy, and blue words are the opposite. In broad strokes, it seems to me that geeky words are more about stuff (e.g., “#stuff”), while nerdy words are more about ideas (e.g., “hypothesis”). Geeks are fans, and fans collect stuff; nerds are practitioners, and practitioners play with ideas. Of course, geeks can collect ideas and nerds play with stuff, too. Plus, they aren’t two distinct personalities as much as different aspects of personality. Generally, the data seem to affirm my thinking. For more analysis (which is technically nerdy, but is pretty geeky, too) and a hi-res version of the plot, visit Settles' blog.